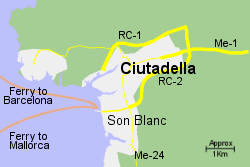 Map of the Ciutadella Ferry Port area. The old Ciutadella ferry port is located is located within the town of Ciutadella, on the north west coast of Menorca, approximately 40km from the capital, Mahon. This is a natural deep water inlet but a bit crowded for large ferries to manouver. However a new docking facilitiy has been built 3Km south of the town, by an area named Son Blanc. 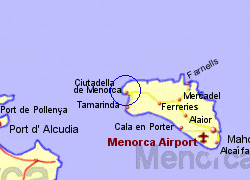 Ciutadella is connected to the capital city Mahon by the Me-1 road, the 50Km trip taking around 45 minutes by car. 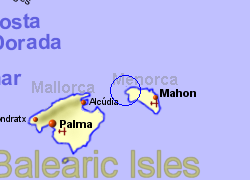 A bus service runs between Port Son Blanc and the centre of Ciutadella, from where there is a frequent bus service to Mahon. Operated by Balearia, up to 14 crossings per week, crossing time 2hrs. 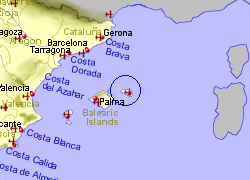 Operated by Balearia with up to 13 crossings per week, crossing time 5 1/2hr.